austin – HubNut – celebrating the average! A fleet reduction has become a necessity. When you’re living on a reduced income, which we very much are (happily out of lifestyle choice rather than economic gloom), it has to be said that running five elderly vehicles is not easy! Even though I do much of the servicing and upkeep myself, there’s still road tax, insurance (group classic policies minimise this though) and MOTs to consider. Betsy proved surprisingly reliable in daily use, especially given that Rachel was using her for the commute. At the time, that was either a 20 mile round-trip to Banbury from our then home in Northants, or a remarkable 70 miles to Oxford if Rachel had decided to drive all the way rather than catch the train. She did this for a year and I can’t remember any issues in that time. Generally reliable, but not always! I loved the Mini’s handling, but was less keen on the suspension and cramped driving position. 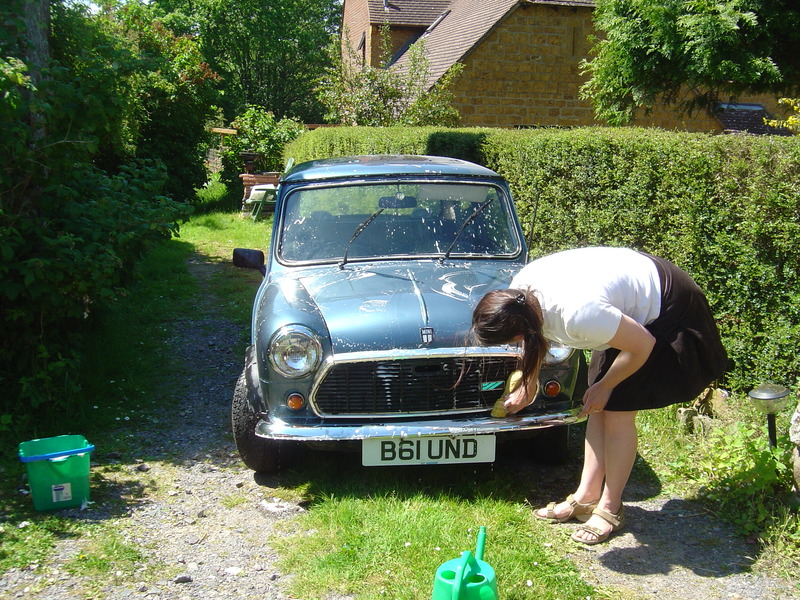 I bravely took ‘Betsy’ the Mini to Kent once, for the Bromley Pageant when I was working on Classic Car Weekly. My aching legs made sure I never spent that much time in it again! We were living in Cambs at the time so it was a long trek. Having received the new wheel stud, I could complete the left-hand side. It all went back together beautifully and with an attractive assistant (the wife) on pedal duty, it was soon bled and functioning correctly. Lovely. Now attention could turn to the opposite side. I lowered the car back to the ground as I needed to reposition it – space is tight in the garage. This time, I remembered to undo the main driveshaft nut BEFORE jacking the car up. Having read the Haynes manual, I decided to remove the caliper complete with pads this time. 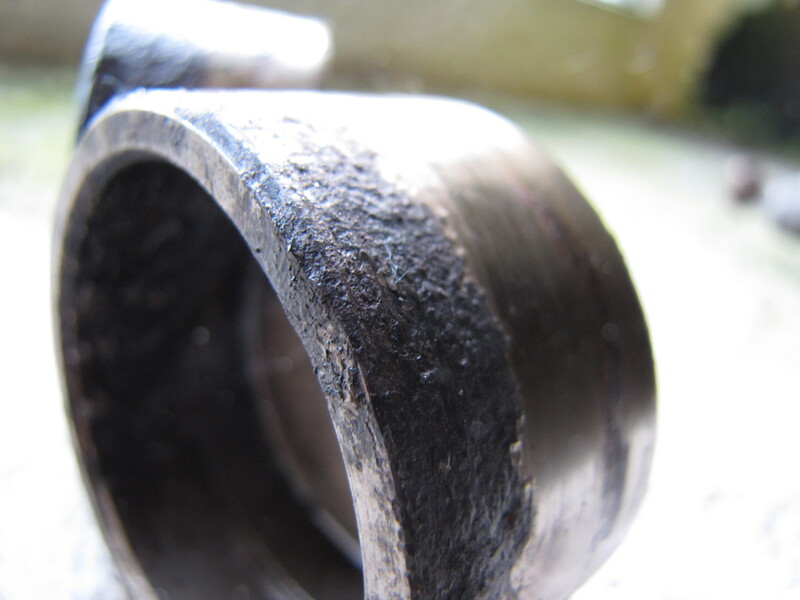 That was stupid – I then couldn’t get the pistons out. So, I connected the caliper back up and with the handy assistant again, could use hydraulic pressure to force the pistons most of the way out – using a spanner to stop the first one from popping all the way out until the second one was also easing outwards. It was then an easy job to use pliers to pull the pistons out – you wouldn’t want to do this if you were planning to re-use the pistons, but I wasn’t. They were in a dreadful state. The only seized bolt on the entire job caused some issues – I couldn’t get the caliper into its two main parts. Eventually, I managed to smash a slightly-too-small socket onto the corroded head, and out it came. There may have been some colourful language before this! I then had to locate another bolt, which involved a trip to see a Mini enthusiast in Aberystwyth. Thanks Dave! This was the side that had seized the most ferociously, and getting the old seals out proved a real ‘bind.’ See what I did there? The new seal holder things are incredibly soft and easy to damage but on this caliper, I actually managed to get one of the new ones to fit – though had to resort to an old one for the second piston. 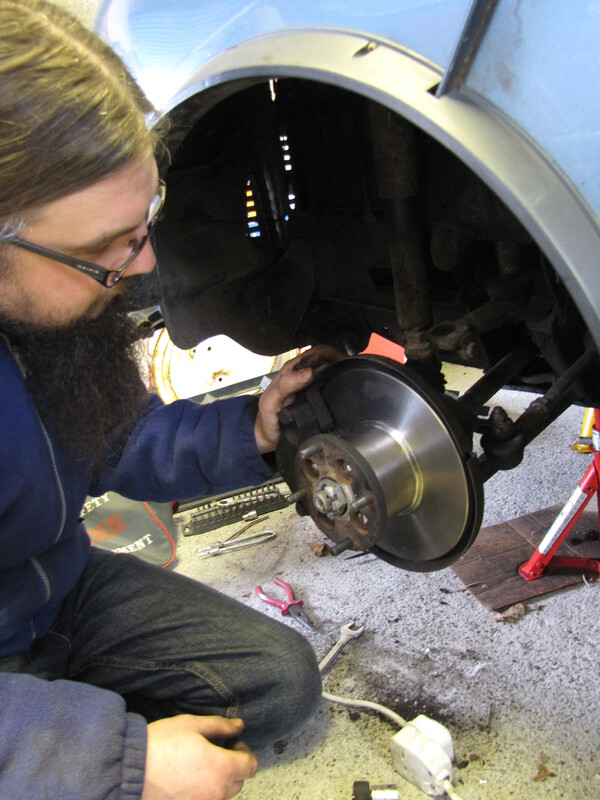 Then it was a simple case of swapping the disc and then re-fitting the caliper. New pads completed the job and with another bleeding session, she was ready to go! The difference on the road was marked. When you’ve only got 45bhp to play with, binding brakes can be a very noticeable drag. I’m still to bed the brakes in – only 8 miles covered so far – but look forward to seeing how they go. Yup, that'll be scrap then. No point putting this back on. With fixed brakes, Betsy the Mini is ready to go! It was going so well. 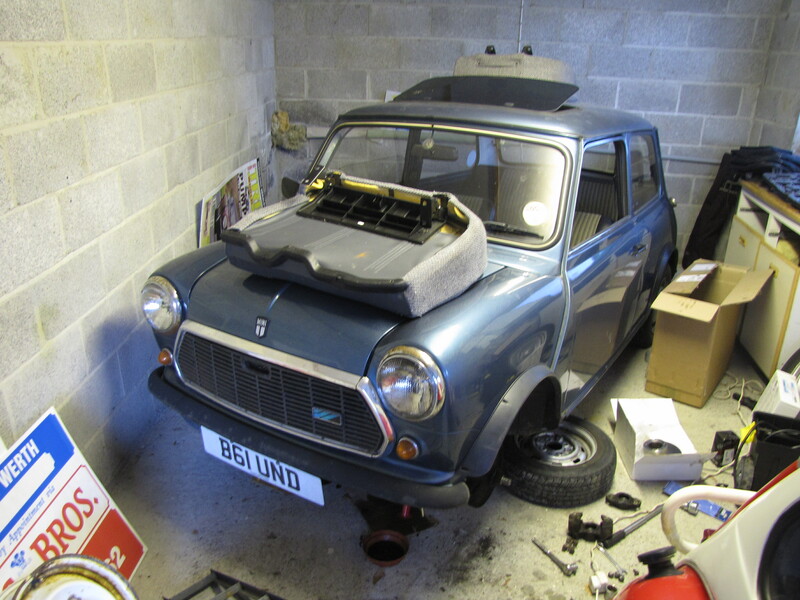 Despite a hectic week with much writing work, I actually managed to find some time to work on the Mini’s brakes. They’d started binding really badly and before Christmas, I had the pads out and discovered seriously manky pistons (see below). Rebuild time. Rimmer Brothers were able to supply the bits I needed and after finally getting my hands on the necessary tools (Ebay saved me a fortune) I could begin work. Being a bloke, I decided to find my own way, rather than lower myself to reading instructions. This was how I ended up removing the caliper BEFORE undoing the main driveshaft nut. That made removing the brake disc (I decided to replace everything) impossible. Fortunately, I managed to put the wheel back on, jam a ramp underneath and then undo the driveshaft nut without having to go through the rigmarole of lowering the car of its axle stands. No wonder the brakes were binding - and this is the better side! 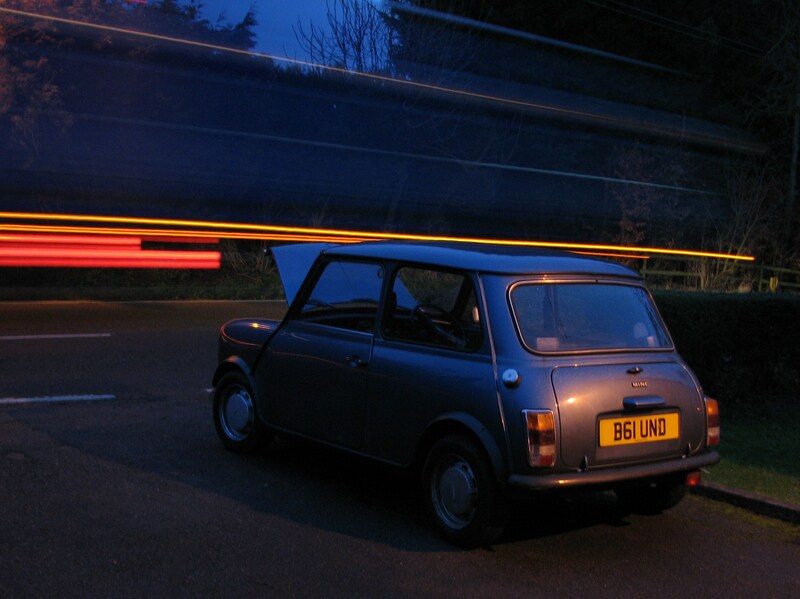 To be a classic motoring journalist, you need driving skills like no-one else. You must be able to jump from one classic to the next and quickly adjust – well, you can’t go around pranging people’s lovely classics because you didn’t know where the brake was. Ergonomics were yet to be discovered even as late as the 1950s. Take a Citroen DS, Ford Zodiac Mk2, Daimler Conquest and Austin Westminster A90 for example. All were in production in 1956 and the differences are staggering. Sure, the DS was quite unlike anything else at all, but let’s focus for the time being on gearchanges. On the DS, you move a small arm that sprouts from the top of the steering column in its own quadrant. The car looks after the gearchange and clutch operation for you – you just tell it what gear to be in. The Daimler uses a pre-select gearbox, so while there is a ‘clutch’ pedal, you don’t use it as one. To move away, just select first and raise the revs – the fluid flywheel transmit the power. 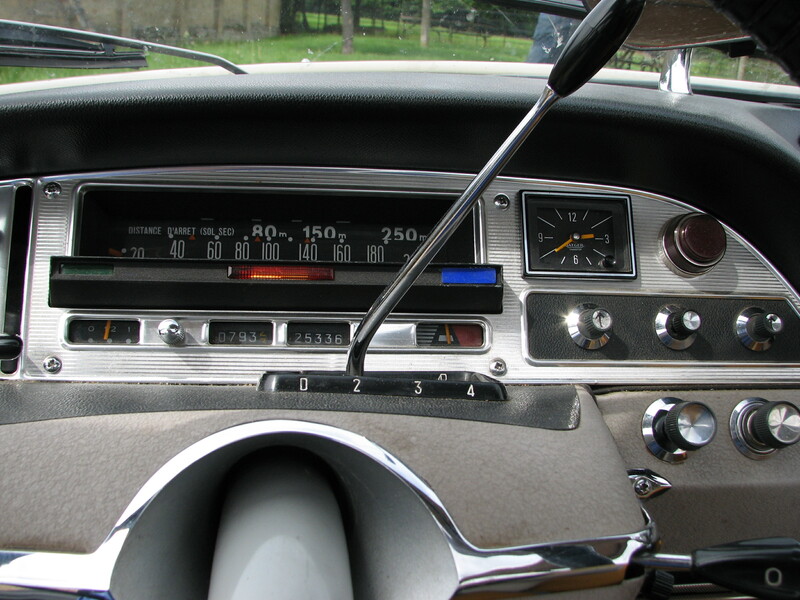 Select the next gear using the column change and operate the pedal when you want it to engage. In theory, the Ford and Austin are much closer. Both have a column gearchange to a conventional gearbox – the Ford packs three cogs while the Austin manages four. But consider how you select first. On the Ford, you push the lever away and down, the Austin away and up. Second? Towards and up on the Zodiac, but straight down from first on the Westie. It’s learning to adjust to these differences that enables us to do our jobs quickly and without breaking stuff. Yet there’s always one that nearly catches you out. Austin Sevens I always find hard work. The clutch is a button with about an inch of travel, the steering is exceedingly vague and the brakes – especially on earlier uncoupled versions – are horrifically poor. I always return with a smile on my face though, even when one recalcitrant Ruby conked out on my test drive and only came back to life after vigorous hand-cranking. A journey in a Seven is never dull. 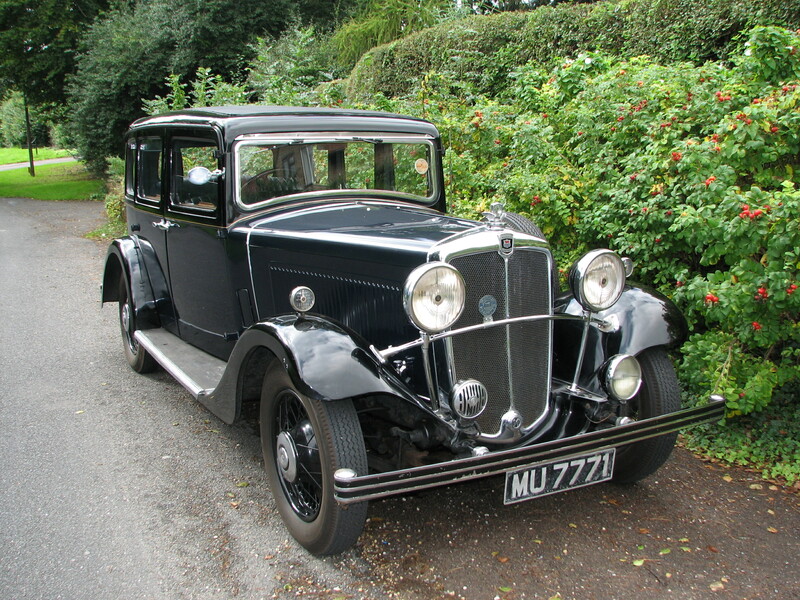 But it was a Morris Oxford Six, dating from 1933, in which I almost came a cropper. For a start, the pedals are in the ‘wrong’ order. The throttle is in the middle, the brake where the throttle would normally be. The gearbox thankfully had synchromesh – I had driven an earlier Oxford without it and found coming down the gearbox a real challenge. What I didn’t know is that it had a freewheel! You can picture the scene as I come down a hill towards a red traffic light. I’m already focussing my mind on the pedals, so I don’t accidentally accelerate. 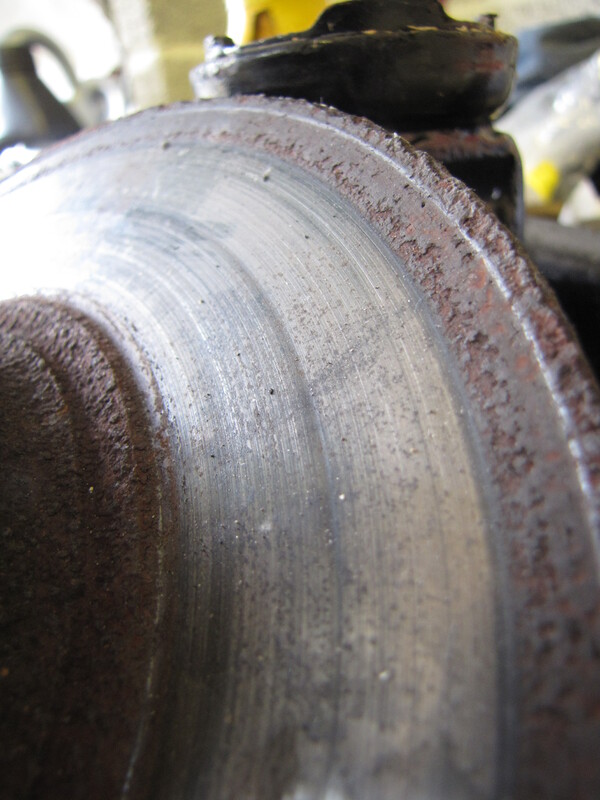 My foot is right down and not a lot is happening – brakes weren’t very good in the 1930s. 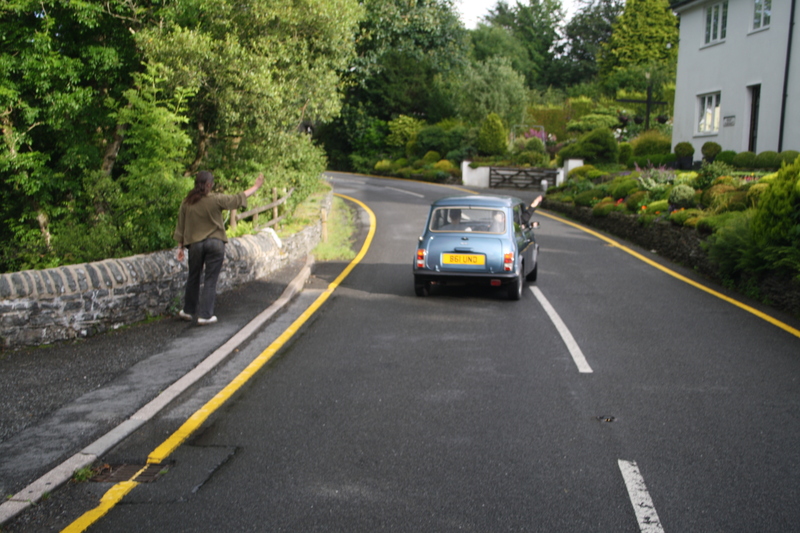 To make matters worse, there is no engine braking as the car is now freewheeling down the hill! My heart was truly in my mouth as I sailed just past the stop line. I’m very glad brakes have improved since then! While it may have scared me, it was a beautiful car. It had a top speed of barely 60 miles an hour, but sounded absolutely beautiful. While it came close to killing me, I still did rather like it! 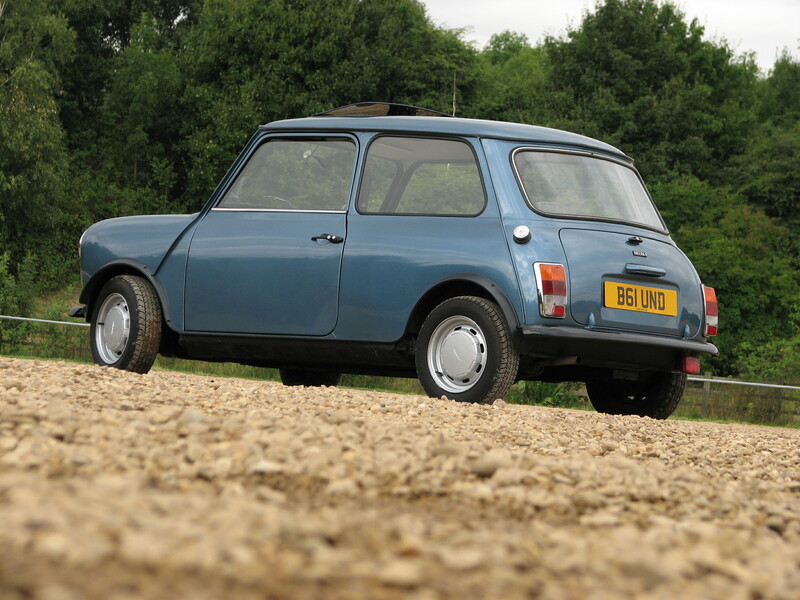 When is an Austin 1100 not an Austin 1100? When it’s an Austin Victoria! 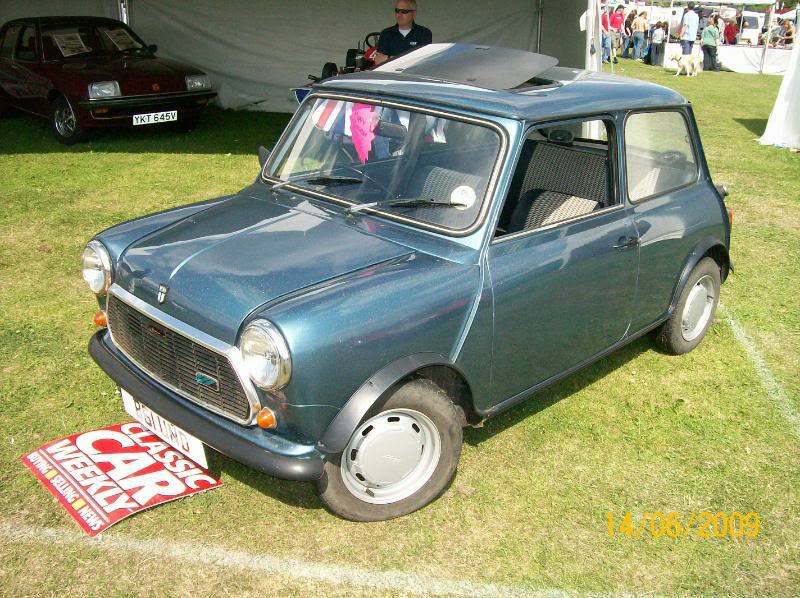 When is an Austin 1100 not an Austin 1100? If you think it looks a lot like a Triumph, then that’s no surprise, as Michelotti himself was responsible for the styling. In fact, the history of this car is a little unusual as it was built by Authi in Spain, but was based on a South African variant of the 1100. 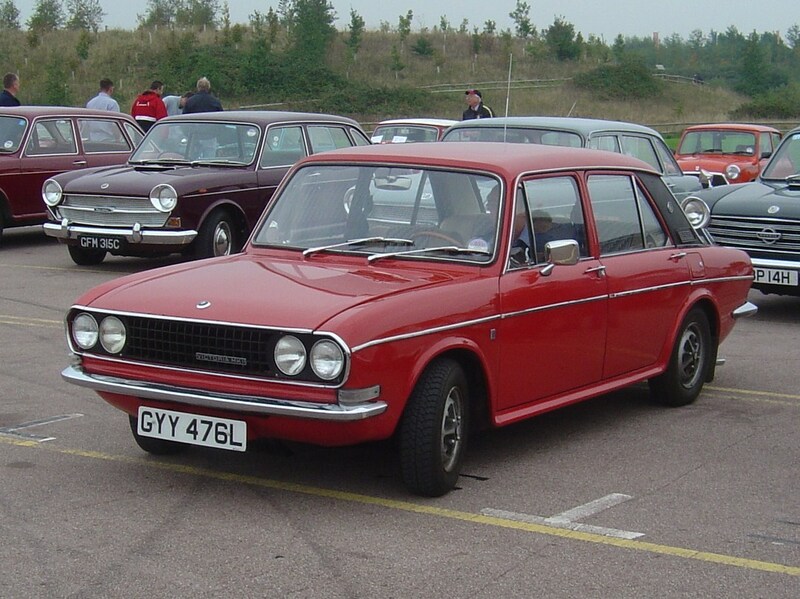 The Victoria was launched in 1972, when UK production was starting to run down. 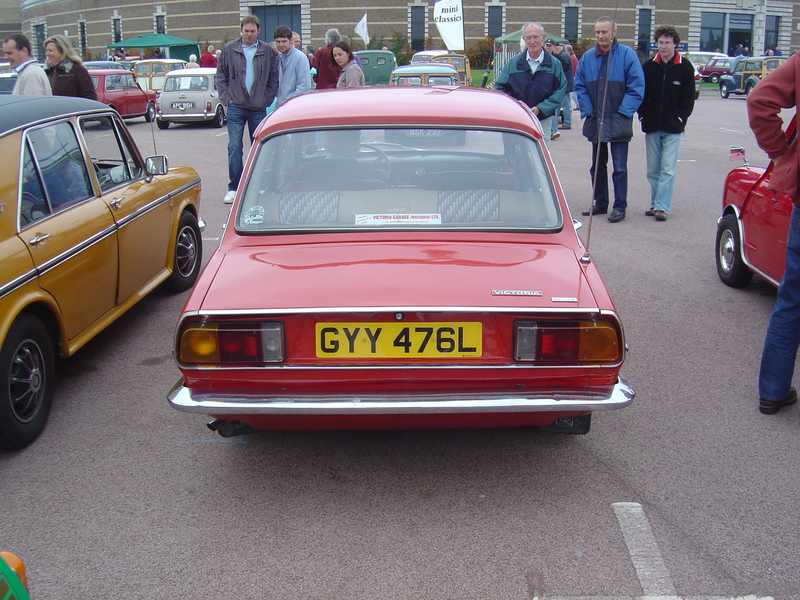 The most interesting aspect of the re-design is the addition of a boot to make the 1100 a proper saloon. The Victoria sadly wasn’t a success, which is a shame as it’s rather an attractive little thing, with all the hoon-ability of the original but a larger dose of practicality. In fact, it was rather more attractive than the South African Apache, which had a rather unhappy snout. From the rear, the design is even more clearly the work of Michelotti, being almost a scaled down version of the Triumph 2000 Mk2. Triumph can’t have been impressed and perhaps that’s why we weren’t treated to the Victoria in the UK. Clearly Michelotti's work - very Triumph-like!